The University of San Carlos (USC or colloquially shortened to San Carlos) is a private Catholic research university in Cebu City, Philippines which is administered by the Society of the Divine Word (SVD) missionaries since 1935. It has five campuses and is one of the oldest universities in Asia - first established in 1595 as Colegio de san Ildefonso. Cebu is an island province situated in the heart of the Philippines, with Cebu City being one of the highly urbanized cities in the country. Also known as the “Queen City of the South”, Cebu City is the center for trade and commerce in the Visayas and Mindanao (2 of the 3 main island groups in the Philippines). 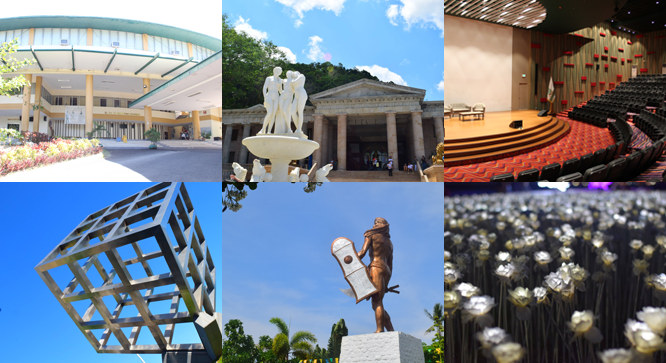 Having a major city, Cebu is not only about fascinating infrastructures and businesses sprouting everywhere and the merry-makings at night, it also brags wonderful sites - both man-made and natural. There are many waterfalls and springs in Cebu you can visit if you want to get away from the bustling city and the mundane life we’re experiencing. Many resorts, white sandy beaches and islets scattered around Cebu. Cebu also has beautiful and warm people who will welcome you and introduce you to delicious Filipino cuisines and delicacies. Filipinos are known to be multilingual and fluent English speakers. Cebuano, Filipino, and English are mainly used in Cebu. The official currency of the country is the Philippine Peso. 1 US Dollar = 53 Philippine Peso. The power sockets are of type A (USA). The standard voltage is 220V and the standard frequency is 60 Hz. Cebu City is accessible via air through the Mactan–Cebu International Airport, which is located in Lapu-Lapu City. On ground, taxis are available. Transportation network companies such as Grab are also available. The Philippines is situated in the tropical zone and has 2 seasons, the wet or the rainy season and the dry or the summer season. October is the end of the rainy season and the temperature is between 22 and 29 degrees Celsius. Ayala Center Cebu. Located in the heart of Uptown Cebu, Ayala Center is the closest large mall. SM City Cebu. SM City Cebu is a seven level complex with 8 cinemas including one IMAX theatre. SM Seaside Cebu. Located away from the city overlooking the sea, SM Seaside is the 3rd largest shopping mall in the Philippines and the 6th largest in Cebu. Basilica del Santo Nino. Catholic church dating to the 1500s, rebuilt in the 1700s, known for its statue of Jesus as a child. Temple of Leah. Built in 2012, this elaborate Roman-style temple is dedicated to Leah Villa Albino-Adarna. Taoist Temple. Cebu Taoist Temple is a Taoist temple located in Beverly Hills Subdivision of Cebu City, Philippines. The temple was built by Cebu’s substantial Chinese community in 1972. Museo Sugbo. Museo Sugbo is the Cebu Provincial Museum located in the former Cebu Provincial Detention and Rehabilitation Center, four blocks from Plaza Independencia. Fort San Pedro. Fuerte de San Pedro is a military defense structure in Cebu, built by the Spanish during the colonial period under the command of Miguel López de Legazpi, first governor of the Captaincy General of the Philippines.